This Tuesday we’re hearing from David Adam, author of The Man Who Couldn’t Stop, 2015 recipient of the International OCD Foundation’s Illumination Award, and 2016 OCD Conference keynote speaker. I’ve had several different themes of obsessions, and many people I know who have OCD do, too. David struggled with just one, a fear that he’d contract HIV/AIDS, and maybe you do, too. It’s another reminder that OCD is crafty and takes on many forms, but no matter what forms it does take, it’s treatable. Your keynote at the OCD Conference was titled “The Accidental Advocate”—you said you never expected your book would lead to speaking at schools and answering emails from others with OCD. What was your purpose behind writing the book? To tell what I thought was a great story. 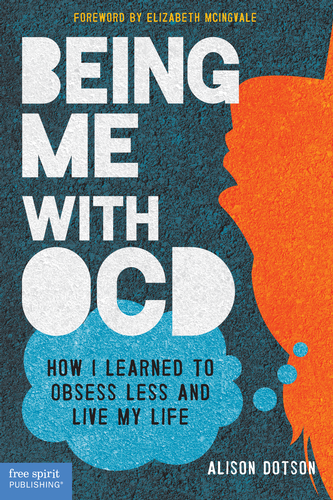 The more I researched and read about OCD and the science and the history, the more I got the sense that there was something in it that people would want to read. And then the journalist in me kicked in and said that I wanted to write it all down before someone else did! The Man Who Couldn’t Stop was a little different from other first-person narratives in that it included an in-depth account of the history and science behind OCD. Why did you want to write about OCD in this way? That was the stuff that I was most interested in. The personal narrative stuff almost came later in the writing, as a way to stitch all the material together and to provide a narrative structure. Books, I have learned, are all about narrative structure! Writing and speaking about your OCD helps people with OCD feel less alone, particularly those who relate to your AIDS-related obsessions. Has being open about it helped you as well? Yes, it’s helped with the indirect harm that was caused by previously keeping it (or anything that central to someone’s life) secret. But it hasn’t helped with the actual symptoms of the OCD, and why would it? If only it were that simple. During your keynote address, you mentioned that while many people have told you you’re brave for sharing your story, you think young people taking on advocacy are the truly brave ones. Why did you say that? Because to an extent I have little to lose. I am in my 40s, have a wife and children and a job. I think it’s brave to confront a situation like OCD head-on when you know that it could follow you around—when one goes for the job, for instance. And because it takes guts to do so rather than try to pretend it wasn’t as serious as it was, which I did as an excuse not to get help. Although you didn’t mean to become an advocate yourself, do you have any advice for my readers who want to get into advocacy themselves? One reason I was hesitant is simply because there are plenty of organizations who do it so well, and who would welcome help I am sure—just Google your local OCD charity or help group! OCD kept its grip on you for many years, but it wasn’t until after you became a father that you became serious about addressing your obsessions and compulsions head-on. Can you tell us more about that? I simply didn’t want to do anything that would make my daughter (at the time, now a son also) more likely to follow me and to develop OCD. And after I started to involved my daughter in my own OCD thoughts and rituals, then that was the push I needed. That’s it’s about behavior. It’s a pathology of thought. And that is what makes it so difficult. Tell someone, a friend or family member. And then realize it’s a medical problem that probably won’t go away without medical help.